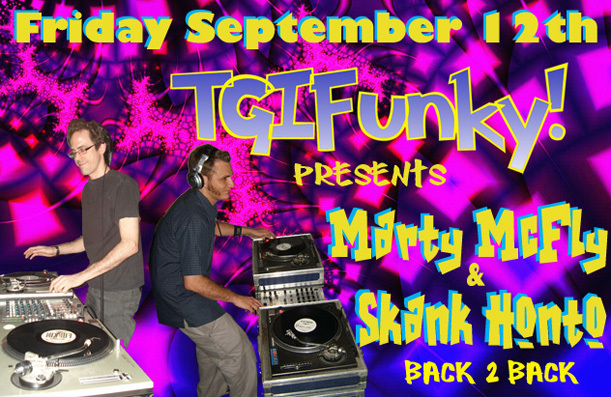 Welcome to www.TGIFunky.com: Play those funky breakbeats, white boys! TGIFunky! is proud to present a back2back set that is likely to be one for the ages! Toronto veteran Marty McFly and London breaks master Skank Honto will be stepping up to play an exciting tag team set of some of the most classic breaks tunes, with some great new party rockin' beats in the mix as well. and to make the night even better, we are celebrating the birthday of Sherri Gallagher of Scandal House Designs!!! ladies take note, and check out the site for some slick threads! opening beats supplied by Aurakal.